It’s not what you know, it’s who you know. Make sure Oklahoma knows your face. Oklahoma Magazine introduces Faces of Oklahoma, a unique, notable opportunity to showcase your business as the face of your field. Faces of Oklahoma is a portrait-style advertising section that features artistic black and white photography taken by one of Oklahoma’s premiere photographers that will provide you a visually compelling platform to share your message with Oklahoma Magazine’s 78,500 average readers per month and 48,000 social media followers. Faces of Oklahoma’s uniquely titled advertorial features allow you to be the only business with your specific headline and let you tell our readers why you’re at the top. Whether you’re the leader of a large company known for medicine, finance or law or the pioneer on the brink of greatness in your field, what is it you want to be known for in your discipline? Oklahoma Magazine will help you discover your brand statement and announce it to our readers, website visitors and social media followers. Reserve your space now to be the exclusive face from your field. 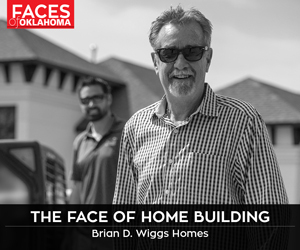 A listing in Oklahoma Magazine’s Faces of Oklahoma advertorial, included in our September issue. Listings are available in a two-page spread (300 words, maximum 14 people) or one page listing (150 words, maximum 7 people). A digital version of your page within the section will be hosted on okmag.com for 12 full months. 10 copies of the magazine. Up to 10 reprints available upon request. 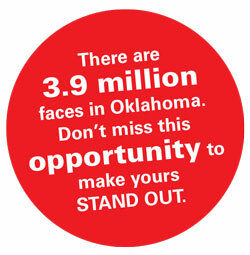 Be the Face of the Day on Oklahoma Magazine’s Facebook page and Twitter account.